K: Greetings once again, our faithful listeners. “The Dearly Departeds’ Disclosure Power Hour” is about to begin. I, the maid of this vacation home for now three years, Kirimoto, will be your host. K: Thank you for the applause. Now let us begin. First up we have the first sacrifice of the game, the owner of the vacation home, Miss Arisa. K: There was only one vote cast for you, Miss Arisa. For that vote, the survivors were given water as their relief item. Would you mind disclosing who you think voted for you? A: Gladly. It was none other than him! K: Quite the confidence you have there! A: I realized it after listening to the last episode. To think he was seeing someone else behind my back. And with Natsu no less. K: Huh? H-h-hold on there for a second. If I understand correctly, you’re saying the one who killed you was Yuuto-san. K: You’ll be safe here. Don’t move. I’ll be right back. I’m going to go check the surrounding area. That is how Miss Arisa and her friends got trapped in that room and were forced to take part in that horrendous game. K: Greetings, our faithful listeners. It has been quite a while since last you heard of me, the maid of this vacation home, Kirimoto, has it not? I’d like to start this episode by having a little chat with the sacrifices of the game thus far. First up we have the owner of the vacation home, Miss Arisa! A: To think that I of all people would be the first to die. K: If we look at the vote data, we can see that only one vote was cast. The rest went unregistered. The survivors of that round were given water in exchange for your life. A: Unbelievable really, the gall of the person to cast a vote for me. I mean, if it weren’t for me, they wouldn’t have even been able to step foot into such a gorgeous vacation home. K: Quite true, but there are those who would inversely blame you. Had you not invited them, this whole ordeal would have never transpired, no? A: Are you saying that’s why I was killed? C: Who would do this? N: Chiaki, was that your stomach? C: Drinking all that water kinda made me hungry. N: It’s good to see you still have an appetite. C: You say that as if a normal person wouldn’t. But the more you think about how you don’t have food, the hungrier you’ll just make yourself. T: We’ll probably get some food the next time one of us gets killed off. N: Takeshi! Now’s not the time for that. T: I’m just joking around. N: Those aren’t the types of jokes you should be making. Especially not when it’s your friends’ lives on the line. T: Yeah but, if we keep starving ourselves, we’ll all just end up dying anyways. N: Are you saying you’re fine sacrificing your friends? T: Natsu, I understand what you’re trying to say, but Arisa’s death benefited us. Now we have water and don’t need to worry about dying of thirst. Hell, weren’t you over there just a minute ago guzzling down that water? C: Speaking of which, who voted for Arisa? We’re kind of forgetting that one of us just killed her, you know. Doesn’t that make them like, the perpetrator? Reinlite: Slightly different from what you’ll find on this site, I am proud to bring you all a full translation of the four part radio version of Week End Survivor. I am not 100% on the differences as I have not watched the play, but I have read the story developments are different as well as the ending. Also, in this radio version, there are less characters and the members playing their roles have been switched around, so this version shouldn’t (completely) ruin you on the play. Without further ado, I hope you enjoy Week End Survivor Radio Drama ver. 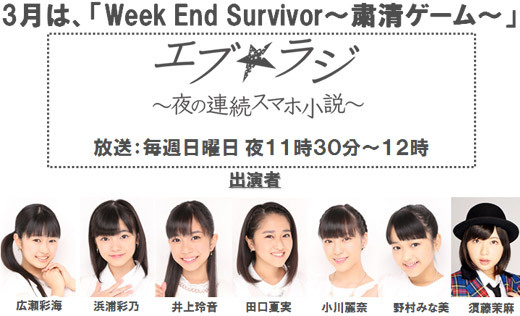 This month’s program is “Week End Survivor”. Published by Every Star, written by Shiono You, “Week End Survivor: An Extermination Game” is the winner of both the BS-TBS Award and Futabasha Award from 2014’s Smart Phone Short Story Awards. The cast will comprise of six members from the newest Hello Project Kenshuusei group, Kobushi Factory, and Berryz Koubou’s Sudou Maasa. In this first episode, we have Hirose Ayaka as the main character, Natsu, Hamaura Ayano as the leader of the group, Yuuto, Inoue Rei as the pompous Arisa, Taguchi Natsumi as the delinquent, Takeshi, Ogawa Rena as the popular Chiaki, Nomura Minami as the recently returned from living abroad Mina, Sudou Maasa as the maid, Kirimoto, and TBS-954 News Announcer Tanaka Hitomi as the cell phone voice. Script written by Oota Yoshinari. With that, enjoy the first episode of “Week End Survivor”.